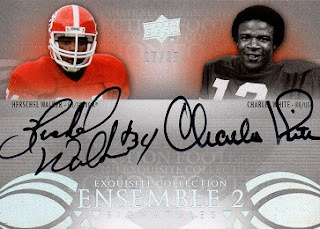 This is a dual autographed card from the 2011 Upper Deck Exquisite Ensemble line. This set features autographs of two former college stars, in this case, Georgia's Herschel Walker, and U.S.C. 's Charles White. The card is serial numbered to 25, with this example being #17. There is also an Ensemble 3, and Ensemble 4 set, which, as one would expect, are signatures of either three, or four, athletes on each card. Those cards are tougher to get, with the "3's" numbered to 15; and the "4's" numbered to just 5. All in all, a nice dual signed card from two Heisman Trophy winners. Nice card. 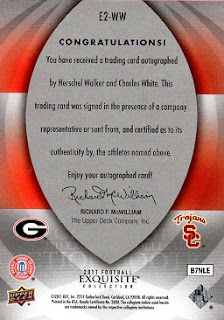 It's one that would fit in my collection as White was a Browns draft pick. Thanks Angus. I always liked White in college, and thought he would have had a better pro career, however, addiction was an issue.